Argentina were simply too good in all departments for the U.S. to even hint at pulling off an upset. Of course it didn’t help that the Americans gave up a goal in just the thid minute when Lionel Messi’s clever chip over the top was headed in by Ezequiel Lavezzi past U.S keeper Brad Guzan who was caught in no man’s land. Messi then made it 2-0 with a sublime free-kick from 25 yards out which not even a leaping fourth-quarter LeBron James would have been able to keep out. That was practically game over. The U.S stuck at their task but when they came out after the break and conceded a third, Gonzalo Higuain scoring within five minutes of the restart, it became a mere game of damage limitation. The fourth came in the 86th with Messi pouncing on poor defending from Steve Birnbaum and then cleverly switching the ball to Higuain to finish off the night. It wasn’t just the genius of Messi, who became his country’s all-time top scorer with his 55th goal, Argentina’s skill, intelligence, awareness and swift movement with and without the ball, were simply too much for an American team that was chasing shadows for most of the game. 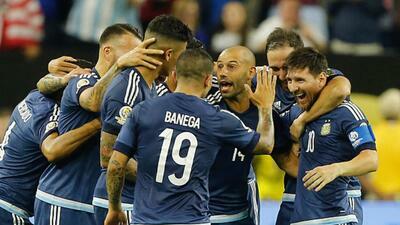 Argentina are the best team in the world at the moment and looked like it. Simple as that. Whoever face them in Sunday’s final, Colombia or Chile, will have a tough task. As for the U.S? Well games like these tend to expose a team’s limitations and there was nothing more evident than the Americans’ poor passing under pressure (and even at times when not under pressure). No amount of tactics or selection choices can compensate for lack of technique in that area. It is one of the reasons why Jurgen Klinsmann often talks about wanting his players to play week-in, week-out against the best in the world. Being able to quickly lay off the ball to a team-mate is a habit that is picked up by constantly playing in high intensity games. The U.S’s entire midfield was made up of MLS players and the reality is that MLS is not yet at the level of intensity of the top European or South American leagues. Chile’s 7-0 demolition of Mexico in the quarter-finals raised the fear for U.S. fans that their team could also be taken apart in similar fashion. But whereas Mexico seemed to lose their focus and will early in the second half, falling to an utterly humiliating loss, the U.S. stuck at their task with determination until the end. Sure, Argentina looked like they were in a training session for parts of the second half but if the U.S hadn’t shown their admirable spirit yet again this could have been a nightmare night for a team in the national spotlight. The U.S were drawn in a tough group and lost their opening game to Colombia in a manner which didn’t indicate they were likely to progress. But Klinsmann adjusted the team’s formation slightly and good wins against Costa Rica and Paraguay followed. Beating Ecuador in the quarter-finals was no mean achievement and a place in the last four was probably as good as it was ever going to get for the U.S.. To make a real impact in Russia in 2018 will require younger players to come through quickly and hit higher levels than the current crop.